Logistic Solutions Inc., at WWFH 2018 - Logistic Solutions INC.
Logistic Solutions Inc., (LSI)’s President Al Limaye with Giovanni Caforio – CEO of Bristol-Myers Squibb (BMS) and Elizabeth Elizabete Miranda – President & CEO of CQ Fluency. 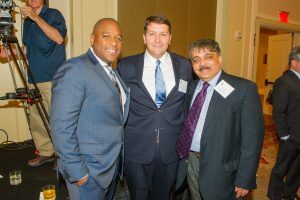 Additionally, Al Limaye with Rondu Vincent – Director of Supplier Diversity at BMS and Chris Baggett – Director of Federal Government Affairs and Political Strategy at BMS. 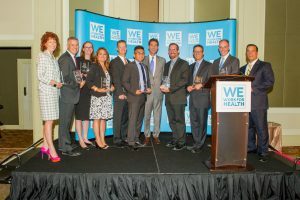 The final image shows those who received awards at the 2018 We Work for Health Summit in Washington, DC. 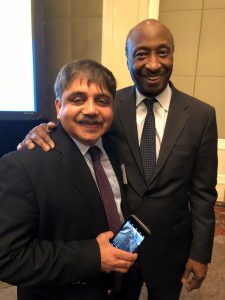 LSI President Al Limaye with Joaquin Duato, Vice Chairman of Executive Committees at Johnson & Johnson, and Ken Frazier, CEO of Merck, at the 2018 We Work for Health Summit in Washington, DC. 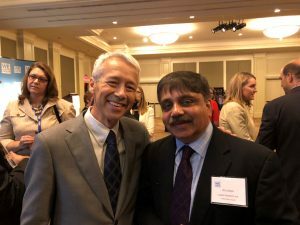 Logistic Solutions Inc., (LSI) attended the WWFH Summit again this year and Bristol-Myers Squibb CEO Giovanni Caforio and team were instrumental in LSI’s attendance at this prestigious event. This year’s discussion included importation of medications and changes to parts B & D of Medicare. As a preferred minority supplier in the pharmaceutical field, it was extremely important for LSI to weigh in on these relevant topics. Logistic Solutions Inc., would like to extend a thank you to Bristol-Myers Squibb and their team for providing us with the opportunity to be one of a select few to represent New Jersey. We will continue to help impact the community in a positive way. For the second consecutive year, LSI has been a part of the WWFH Summit, a meeting with conversations with congressmen and women from 14 different states. The two day long discussions raise concern about legislation in the pharmaceutical field. LSI is a preferred minority supplier in the pharmaceutical field, and was one of a handful representing New Jersey in talks that discussed importation of medication and changes to medicare.